Mualang is a Malayic( Dayak) language spoken in the interior of western Kalimantan (Borneo), Indonesia. Given the relatively large number of speakers (approximately 40,000 people), and due to its fairly isolated geography and some well maintained socio cultural traditions, the study of the language considerably broadens our knowledge of the Ibanic language family and the Malayic language group in general. Western Borneo has been posited as a possible homeland candidate of Proto Malayic speakers. Therefore, linguistic contributions about inland languages in areas such as that of the Mualang language and people will provide Austronesian linguists with more information regarding this issue. 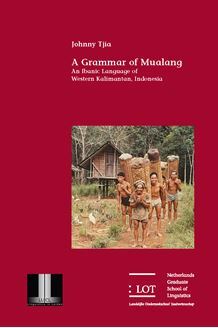 This study presents a full descriptive account of the grammar of Mualang, covering the major features of phonology and morphosyntax as well as issues related to pragmatics. This grammar is the result of a combination of textual analysis, elicitation and participant observation. The grammar is supplemented by wordlists and an extensive collection of glossed and translated texts.